Fatty acids are the basic structural units of lipids, which are dietary fats. The body can synthesize many fatty acids, but those that cannot be manufactured in adequate amounts must be obtained from the diet. These are called essential fatty acids (EFAs). Fatty acids are classified as saturated, monosaturated or polyunsaturated—depending on the amount of hydrogen in the basic carbon chain of the molecule. Influence the production of certain hormones immunity, and cardiovascular health. Maintain the structure and function of the cellular and sub-cellular membranes. Regulate cholesterol transport, degradation, and removal from the body. Influence prostaglandins (hormone-like substances that promote smooth muscle contractions), regulate blood pressure, regulate gastric secretions, and impact other hormones (through a series of enzyme-dependent reactions). Support normal growth, especially of blood vessels and nerves. Keep skin and other tissue youthful and supple by providing lubricating qualities. EFAs are most abundant in fish oils and unadulterated seed oils, such as canola, sunflower, and safflower oils. Flaxseed oil is an exceptional oil, containing both omega-3 and omega-6 essential fatty acids in appreciable amounts. Cold saltwater fatty fish—such as herring, haddock, cod, mackerel, and salmon—are also rich in omega-3 polyunsaturates and serve as the source of fish oil supplements. The most important fatty acids are linoleic acid, gamma-linolenic acid (GLA), eicosapentaenoic acid (EPA), and docosahexaenoic acid (DHA). Omega-3 fatty acids: flaxseed oil and fish oils (MaxEPA). Omega-6 fatty acids: evening primrose oil and borage oils (Super GLA). 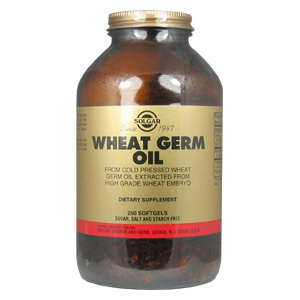 Solgar's Wheat Germ Oil is cold pressed from the wheat embryo of high grade wheat. Solgar's Wheat Germ Oil Softgels are free of corn, yeast, wheat, soy and dairy products and are formulated without the use of preservatives, artificial flavors or colors. Wheat Germ Oil is shipped in a discrete, unmarked package. Orders are processed immediately and usually take about 3 to 5 working days to be received. We do ask that you try it for 2 to 3 weeks to feel the full effects. Any information received is used only for order processing and shipping purposes. Your information, such as e-mail address, will never be disclosed to a third party.